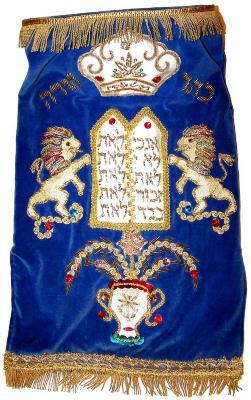 Blue velvet mantle, with gold fringe and appliqued border; traditional design in white satin applique, Tablets flanked by heraldic lions, crown, above urn with flowers, with additional gold applique and embroidery, pointed with jewels. The Sefer Torah is known to have been ornamented and protected with various adornments and wrappers from earliest days. The Mishnah discusses “figured wrappers” that covered Torah scrolls. The Roman liturgy includes a prayer for “every daughter of Israel who makes a mantle or cover in honor of the Torah.” In some communities, a length of fabric known as a mappah is rolled with the Torah to cover the outside of the area opened for reading. A textile cover may also be placed over an open scroll. The closed scroll is covered with a mantle, generally of fine silk or velvet. Extant full-skirted mantles are known from Sephardi communities. Early Ashkenazi mantles were flat, joined segments of fabric, resembling pillowcases, with spaces at the top for the staves. Most Ashkenazi mantles today feature a rigid oval top, and a tight, straight skirt often decorated with dedicatory inscriptions and symbols. The origins of Congregation Beth El are described in a publication of the Springfield Centennial, found in the Histories file at the American Jewish Archives. “Quite a number of Russian Jews arrived here in the early seventies, but finding (the Ohev Zedukah) congregation “too advanced” they organized themselves into what is called the Old Orthodox Congregation … “This body, at first known simply as Chesed Shel Emes, was the origin of Congregation Beth El. The name was changed in 1920. The congregation is found in The American Jewish Year Book in 1899-1901 as Congregation Chesed Shel Emeth.